Why is 0/0, 0^0, ∞/∞, ∞^0, 1^∞, ∞-∞, and 0.∞ considered as indeterminate and why is k/0 not considered as indeterminate (where k is any real number except zero) even in that case you have 2 possibilities ans may be -∞ or ∞. Please explain why they are all considered as indeterminate but k/0 is not? I'll talk a bit about what we mean by indeterminations. Let's take ∞-∞. To begin with, the expression ∞-∞ does not have any meaning, is like a meaningless combination of letters. However, we sometimes use it to express something quite specific. In fact, we could use any conctant C instead of 1 in the definition of the functions. 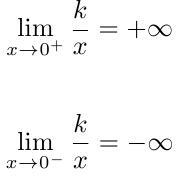 These examples show that there is no appropriate definition for the expression +infinity-infinity. Sometimes it could mean a constant, sometimes could be positive infinity or something else. In the same way we don't have a useful definition for the expressions 0/0, 0^0, ∞/∞, ∞^0, 1^∞ and 0.∞. You said that it could mean just two things: positive infinity or negative infinity. And you're right. That isn't the case with the other indeterminate expressions. For the others, the possibilities are infinite. That is, if we approach 0 from the right, we get positive infinity. If we approach zero from the left, we get negative infinity. The expression k/0 itself does not have a unique meaning, however, we know that we're referring to some kind of infinity.